Well, it isn;t a that good morning here. Oh my, the good fortune Gods have left us at the moment. Yesterday jan got really sick. I think he suffered from it already the evening before, but "tough guy as he is(better call it stubborn) he didn;t say too much. But yesterday he really had it going on him. His belly had swollen(which is not good at itself, but also he has to be careful about his belly button and the umbilical hernia). But on top of it i think his stomach played triks with him, During the day and specially evening it became worse, he had no appetite at all, and then he started to throw up, poor fellow. I saw it on his face he was in pain, and then you feel so helpless, sitting on his side! I already was ready in the earlier evening, to call my friend Heidi, to ask if sheor her husband could come over with the car to bring Jan to hospital. Perhaps not yet directly necessary, but with Jan's health problems, you know, I would feel better. But he wouldn;t hear a word about that. As I should know already. Okay, you can imagine that Jan had a bad night and I had the same. Almost didnt sleep, I woke up all the time, after I finally went to sleep( think I was up till about 2.00 p.m.). but that wasn't much. Jan aso felt extra bad, because today he had his first day of work as volunteer, but no way he could go there. So I called them early morning to explain the situation, with a lot of excuses, but the lady was really nice and understood it. Now I will keep an eye on Jan toay to see if it is getting any better with him. If not, I somehow should persuade him to call his specialist doctor or go right away to hospital to let them have a look. I don;t think this will happen well, let's hope it will not be necessary and that he will feel slightly better during the day and the weekend. It really is a disappointment too for Jan, he looked forward to go to this job. Okay, he just woke up and it seemshe is feeling slightly better. No way he his jumping around at the moment, LOL, but he told me his belly is feeling better a bit, yesterday it was a itght blown balloon, today he can push it in again. That already is good news. Now hoping that it will go better during the day. I think he should try to take as much sleep as possible, and then hope for the best during the weekend. So, I am a bit reliefed, not reassured yet! Good, that's the news I had for you today. Wished it was of another nature, but thinks like this can happen. I think I will take a good nap in the afternoon, that will keep me on my feet. After I finish this post, I will see if Jan gets back to bed, then I quickly will go out for a few groceries. As you can imagine, we didn;t do anything about the sowing yet LOL. It was planned to start yesterday, but something came in between. Well, it still can wait a bit, next week will be a good time too. The one thing I accomplished yesterday(but that was still in the morning)is a new bloglayout. Better something done than nothing at all I think. 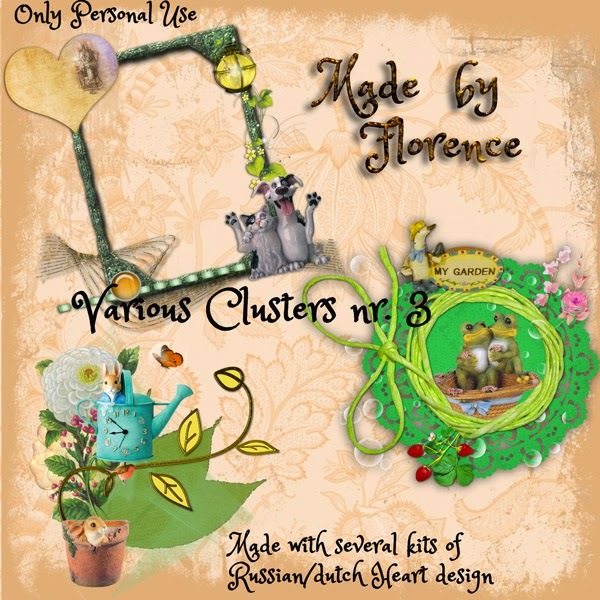 But I have a new freebie for you, this time one of Florence, a set of "springy"clusters to get you a bit in the mood for the spring season, although in many parts of the world winter is still showing itself. I wish you a wonderful weekend, hoping to have much better news on Monday. Some more rain but less cold. Not like other parts on his globe, we have rather good weather. We will have some more rain but if that is the price to pay to have no ice and cold, okay. But the weatherforecast tells us that in the weekend we might reach temmperatures around 9 C (48 F), so that is not bad. I saw already some snowdrops blooming in our garden a good sign that somewhere spring is lngering around the corner(well, that's what I tell myself to keep hope up LOL). Jan definately is busy in his mind with the garden already. Yesterday he spread out all seedpackets I;ve made last year and he wants me to take a look at it telling him what is what and which ones he'll have to sow now and which ones he can sow later, directly in the garden. I don;t mind doing that and it keeps him busy for a while. Yesterday i received a letter from the participation offcie to come over for an interview on Monday the 2nd of March. It will be with the same guy, Jan has as "coach".But guess what, i probably will not have to tell a lot about myself anymore, it seems that Jan told him some things about my "talents"already, and such LOL! Sneeky from Jan, isn;t it? But also nice to prepare the path for me in this way. I think I will go out for a moment today I need to buy a bit of knitting wool for the "project"I am working on at the moment. I am making a new cover blanket for our couch, this one is from thinner and softer wool than one I made last year. Then I will be busy with Jan and the seedpackets. I also proposed to him to make a simple sketch of the garden and make a planting plan with it. It is hard to plant all the seedlings when they are ready at the right place sometimes. I still have a couple of flowers on my climbing rose, that tells you how little winter we had this year! 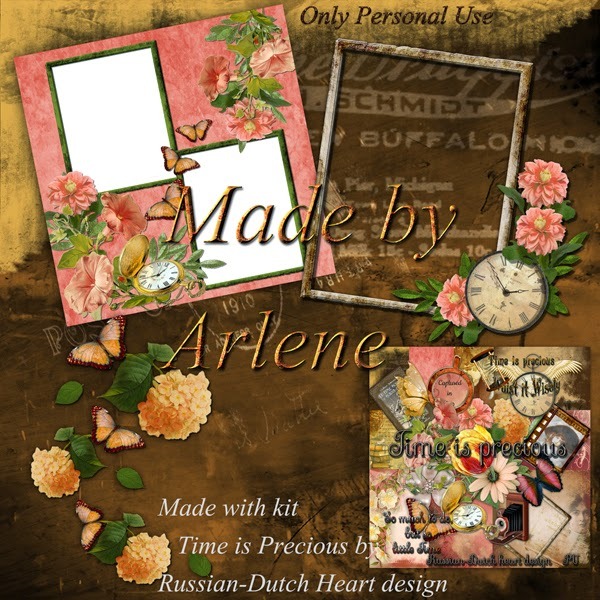 Well, ladies, today I have the clusters from the Time is precious kit for you from Arlene. 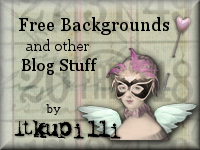 She has another freebie for you on her blog, so have a look! It was a such nice quiet weekend. Weather is going a bit up and down, periods that is is nice and sunny, and periods with lots of rain. Yesterday evening we even had some really fierce wind, lucky all stayed in place in our garden. Oh something funny happened though yesterday morning. Jan has to get him a certification of good conduct, for the volunteer job. Well, he has to go to the council for that, but nice is that the organisation he will be working for will pay for the costs. The office for civil affairs is opened all day, but you can go there without appoinment till 11.00 a.m. But................yesterday morning I was sitting all quiet at the computer but suddenly early morning around 9.30 suddenly Jan came into the room, started to dress himself, quickly took a coffee, mumbled something about opening hours of the council and rushed out of the house. It took me a few seconds to realize where he was going, but..................it was Sunday morning. So I ran to the door and just was able to shout out to Jan that he had to come back. He didn;t understand it, but did so, figuring he might have forgotten something. Him back into the house I asked him what he was going to do. Jan: "well, obvious, I am going to the council". Then I laughed and told him it really only was Sunday morning and he would go there for nothing(lucky it is only about 15min. walk). He looked somewhat besotted at me,asked if I was right, I showed him on the calendar and on tv the day and date and then we both had a good laugh. Now today I will have to wake him on time, because now he can go for the certificate to the office LOL! During the weekend I didn;t do much, but I did spend a lot of time at the computer and almost have a new it ready. But before I can finish the preview and upload the kit, I first have to go out, to get a load of medicins for Jan, of which he is running out. Perhaps on the way back I cna get us a smaller bag of soil, because Jan said he wanted to start sowing plants for this summer. We have lots of tiny pots for that and I took rather a lot of seed of the summer flowers, and if we start now, they will be ready to plant out earlier. So soon eveywhere in the house, where there is a place to put a little tray with pots and seeds, it will be occupied. It really was a weekend of confusion, I have to admit. 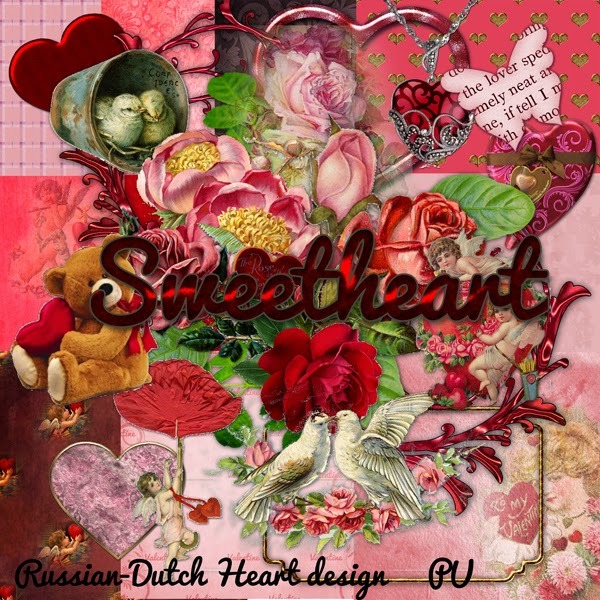 In the weekend I got a few mails from visitors, asking where they could find the second part of the Sweetheart kit. I took a peep on my blog and I had to conclude that I didn;t post it!!!!!!!. What a stupid thing of me! But those things can happen, and are easy to restore. I just have to post it today. Sorry ladies, for the mix up this week, but no serious harm is done, is it?? Oops, time goes fast, I must wake Jan so he has time to drink a coffe to wake up completely, before he goes to the council. 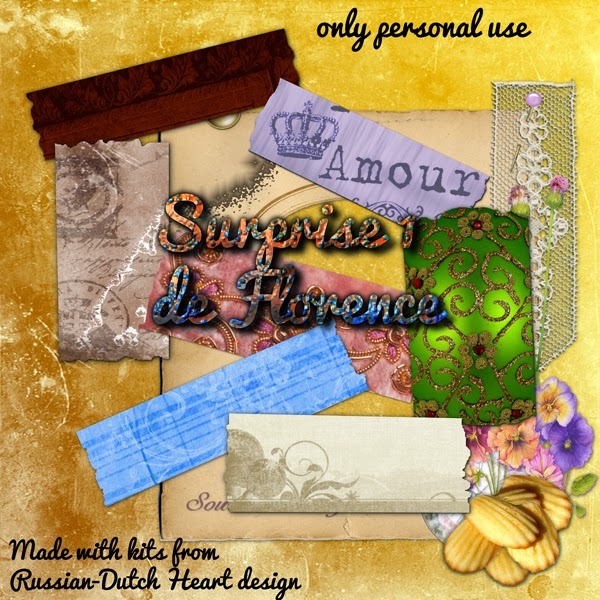 So here is the second part of the Sweetheart kit, and then next post there will be the add-on from Arlene to the Time is Precious kit, okay? Some good news to tell. It feels good to start a post again with some positive news LOL. Wednesday Jan went to the elderly home for an interview and came back quite happy, I must say. He has got a volunteerjob there! Yeah. He told me the interview was nice and that he will start his work there next weekend on Friday. He will `work`there on Friday, Saturday and Sunday afternoon from 4.00 p.m. till 7.00 p.m. and he will help with the dinner. The people have then sandwiches and such as dinner( they get a warm dinner at lunchtime), and he has to distribute the stuff and clear it away when all have finished and get the kitchen a bit in order again. So it is rather light work, no need for him to bring people from their appartment to the dinner and back. The lady who interviewed him was very happy that Jan agreed to work in the weekend, seems they have a bit trouble finding volunteers for it. He will have a contract for this job, only pity is that it brings in no money, except for a compensation of the costs of transport(he needs a tram to get the ). When it is good weather he will take his bike, but it´s nice they pay the transport. Who knows, may be in future it could lead to a kind of payed job? I don+t think so, but you never know how things can change in a year´s time. Now I will soon get an nvitation at the participation office too, I guess and then cross fingers that they can introduce me somewhere too! The last couple of days I was doing some housework, like mopping floors and ironing and doing another load of laundry, and cooking and shopping and also some designing at the computer, so time went fast. It doesn´t look to be such a nice day today outside, at the moment it is raining and we have a bit more wind, but okay, as long as there is no snow and frost, I should be happy. Perhaps it will get better later in the morning, I will have to go to the drugstore to get some medicins for Jan and get a letter at the post. Oh, on Wednesday, when Jan had his interview, he went to the market after it, it´s very close to it. He came back with some veggies and also fruit, among it prunes, LOL! So I think I will make us on Saturday again some knoedel, made of potatoe mash with some semolina. In the centre there will be a prune and the knoedel covered with sugar(best will be icing sugar) will give a yummie easy meal. I only will make the knoedel a bit smaller they will be easier to handle. 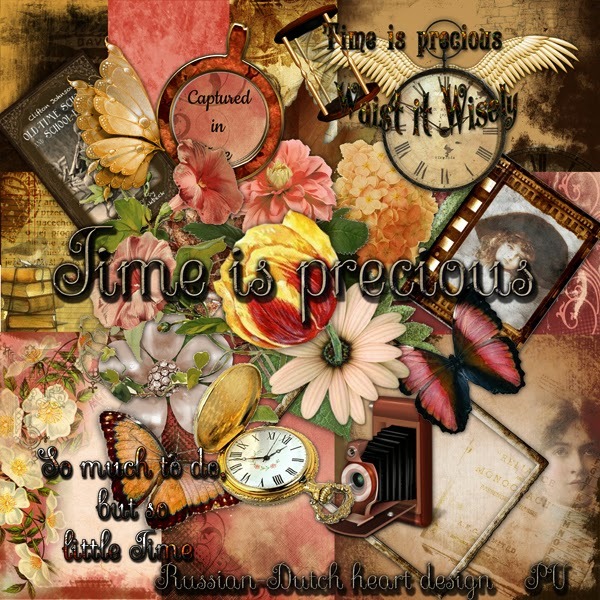 Today you will have the second part of the Time is precious kit. 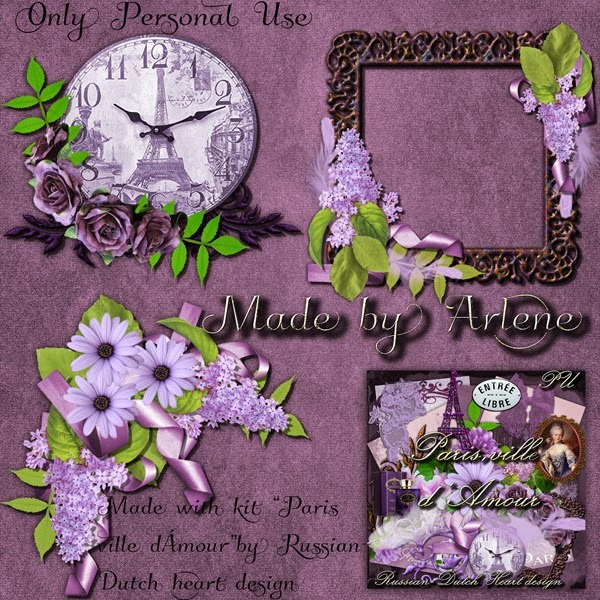 And if you are busy anyway with a bit of bloghopping, then you should go to Arlene´s blog, she just has posted some nice kits(they are available in her shop for a real nice price) and also very lovely freebies! 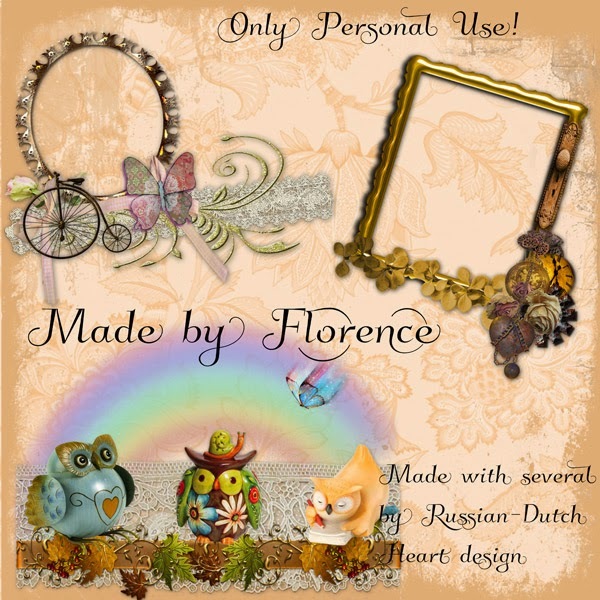 And you also should check out Linda´s blog, there are some awsome quickpages for you too! Another day with sunshine here. It has been a rather nice day yesterday, speaking of the weather, although I didn't go out. I just wanted to take a day off from running around, so I stayed in. But it gave me opportunity to do something about the laundry, so a lot has been ironed now. Jan was busy for a while in the garden, cutting away a lot of the ivy that has grown too much. And if he can do a part of it every day, soon it will look much better. It was a good day to be busy outside, although it was still not warm, but if you stayed "in action", you didn;t feel it too much and there was some sunshine too. So at night here at the coast we have temperatures around or just below zero point, bt at daytime we reach about 7 C.
I worked a bit on a new kit yesterday afternoon, and finally could upload Arlene's clusters from the Sweetheart kit. So I will give them to you today and then Friday the second part of the Time is precious kit. Soon I will have to wake up Jan, because he has his appointment at the elderly home today, for a volunteer job. I so hope he will be succesfull. During the time he is away I can do some needed grocerie shopping and also want to do something about the kitchen floor, it needs a mopping. and then I really should gather all needed papers for sending with an application form I told you about. Time now to do a little bit of bloghopping and then making some coffee and then get busy. I saw that this post still was in draft-mode, so finally here is the post of Monday. Internet was messing up things. Perhaps you were wondering where I was today, but I had the interview at social security office this morning, so no real time to do computering. It was a bit cold but nice weather this morning, with lots of blue sky and sunshine! And when I walked at the sidewalk where there was the sunshine in my back, I could really feel a bit the warmth from the sun! We still have a long way to go before we can get out our t-shirts, but okay, it's a start. The interview with him didn;t took much time, I told him about the volunteer jobs, that didn't work out, but at the least he knew I was seriously trying to get one. And i asked him to list me at the same department where Jan is listed now( and jan will have a volunteer interview on Wednesday at a health care organasation), that the guy there appeared to be nice and interested etc. Well, a small but perhaps important succes for me, he right away sent an email to that participation employee and i should receive an invitation for a talk within 2 weeks. I am happy about it, because that office isn;t very far away from us. I walked back home again, took up a few grocerie things on the way( needed bread and cheese etc) and was home around 12.00 again. I first told Jan about the interview of course, then took a coffee and sandwich and then grabbing together all the energy I had and gave the house a good vacuum cleaning. I had a bit more stuff in mind but was rather tired( I didn;t catch all too much sleep last night, waking up all the time, think because I am afraid not to hear the alarm LOL). So I first took a good nap and I feel lots better now. 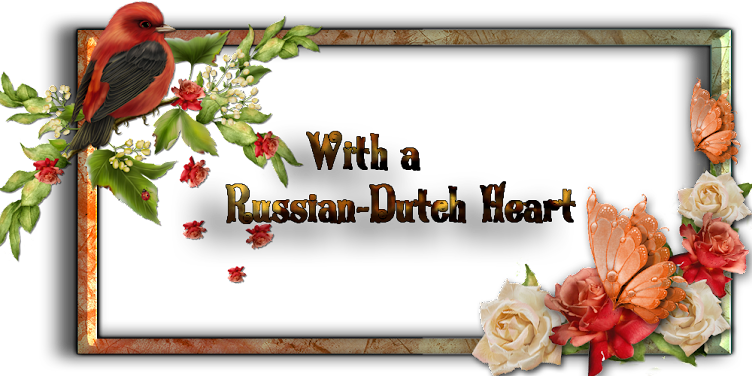 But now I don;t have much time to write this post, soon have to start making some dinner, so i will leave you with this update and Wednesday I will have more time for this again. 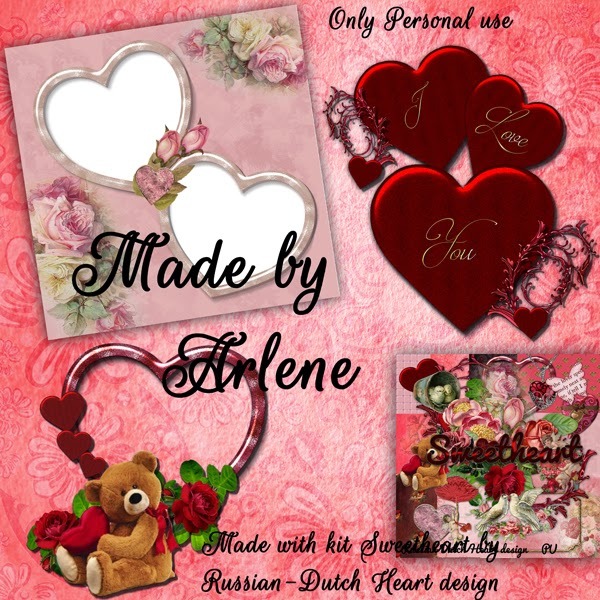 Your freebie today are some lovely clusters from Arlene, she made with the "Sweetheart"kit. Have a great day and till Wednesday. P.S. I wanted to post that freebie, but had to upload it first to Mediafire. 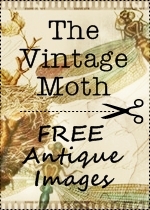 It will not work at the moment so I will give you another freebie and will try to give the meant one on Wednesday. Sorry. New days, new chances, they say! I am getting a bit grunchy here too at times, specially with all high bills coming in. They always come in a group at the beginning of the year(the nastiest ones!). Now it is up to me to do something about it, but it always is such a lot of work. If you have a real low income you can apply for reduction or even remission, but gosh, you have to fill in enourmous forms and send all kind of copies of almost everything with them. I understand the minicipal or other authorities want to know something about you, but they also could just send a form that you have to sign in which you give permission to get info from tax office or other municipal agencies and then they should have almost every information. Perhaps one or two copies of special things and vooila, all done. But no. For every occasion you will have to send a pile of copies again. Soooo frustrating. And then it isn;t yet sure that they will grant you request! Well, I will try to start on it in the weekend, get all I need together then make copies start of next week and then cross fingers that it is good enough and such. Jan has gone to an appointment from a department of social security where they coordinate volunteer work and this person will be your coach too, as I understand it. Well, Jan can show he is working on getting a volunteer job, but without succes till now. we'll see what will be the outcome of the conversation there, May be they will have a nice little job and if they could introduce him, it will be easier to get the job. Monday I have an appointment finally with the social security guy, I had to go to last month, but seemed to be ill, remember?? It still took about a month before I heard anything from him! All those appointments take precious time and non of them seem to be very helpfull, till now. But you have to go, if not, or if you come late, you might get a penalty on your payment! Somehow I can understand it, but on the other hand, if they cut on your already very poor income, people might come into trouble, because they cannot pay the necessary bills anymore and what then? So i wonder if that really is the best of measurement. Let's try to go to a brighter side of life. The weather looks rather nice today, the sun i shining, large parts of blue sky, almost no wind. Temperatures are around 7 C here now, so not too bad for the time of year. This weekend there is some speedskating to watch, World Championship for different distances, like 500, 1000, 1500, 3000,5000 and 10.000 metres.We already have one golden and one silver medal on the 10.000 mtrs for men( all started already yesterday) and a silver and bronze one on the 3000 mtrs. for women. So this event will help to forget a moment about all official and nasty things, but reality will come back real soon too LOL! Yesterday I was busy for several hours( including waiting time for dough that had to rize) in the kitchen. 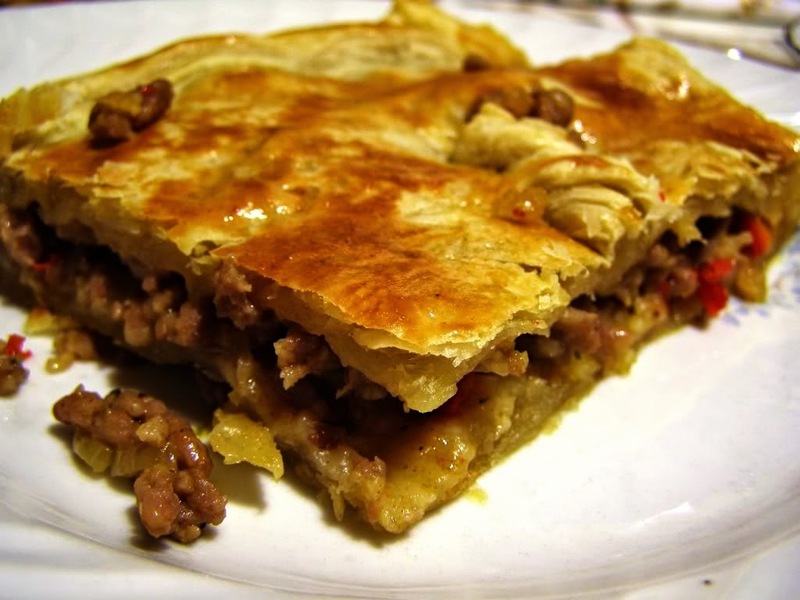 Made a Boeuf parmentier for dinner(is a kind of sheperds pie with minced meat) and also made a Russian pirog for tomorrow which we will have with our soup I'll make. Today is "free cooking day", meaning jan and I will look after ourselves, to make a quick bite. I love those days, I sometimes just have a pizza, or some spaghetti, anyway, something that is ready very quickly, without using a lot of pans and time LOL. And now it's time for your freebie. It will be in 2 downloads again, one today, the other one on Monday(oh, I might post later in the afternoon then, because of my appointment in the morning!). 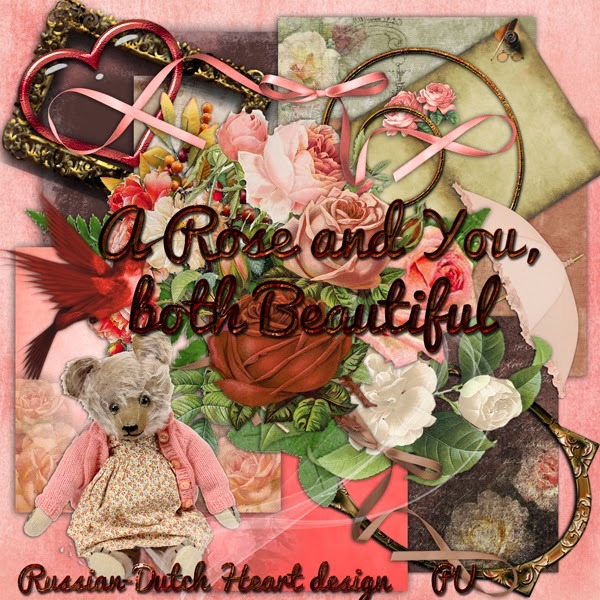 As it is Valentimes day tomorrow, I;ve made a kit for it. And I have a nice surprise to go with it too! A lovely and sweet fram cluster made by Florence. Next week you also will have some additional clusters from Arlene. 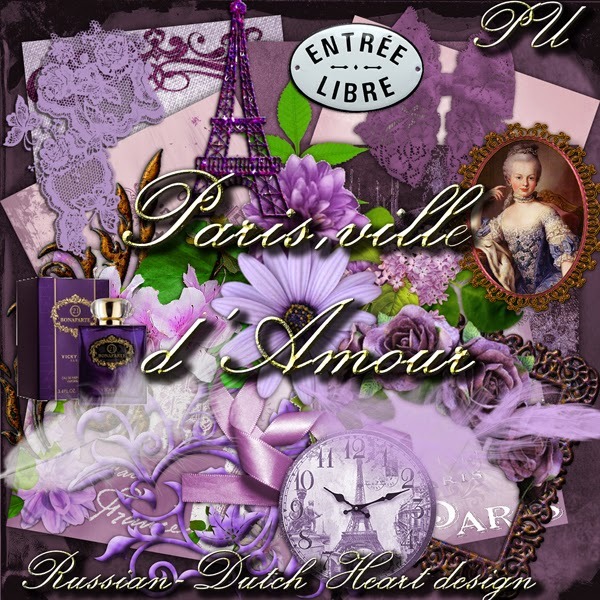 Oh, you also should pop in on her blog, because she also has a lovely Valentine freebie for you. Wishing you all a wonderful weekend, all the folks that are sick and tired of lots of snow I wish a very quick rise of temperature and speedy melting and then sunshine! 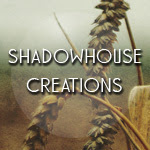 Only had time now to write a little post. This morning Jan and I were up early, because we had to be at the nursing home at 10.00 for the information assembly. Beautiful home and nice people. So we had a little explanation about the in's and out's and filled in forms again. And just a while ago when I checked our email, we already had an answer from the nursing home, that they didn;t want to go on with us any further. This really was a disappointment. Perhaps even more for Jan than it was for me. So we have to look around for a new one, but you should think with all the volunteers asked on the site for volunteerwork, that they would be happy to have people that are at the least a bit motivated and, like Jan, already have experience in working with elderly and such. It is almost as hard to find a volunteerjob that suites you more or less as it is to find a proper job! well, we;ll just have to forget it and start looking again. Best of all is that we have proof for the social security that we are busy with it, but had no success till now. And you almost cannot apply for several aat the same time, because there always is a waiting time till you have an interview and then have to wait for a decision etc.etc. But if we dont find smeting ourselves, there is possibility that social security points out some volunteerwork to you that you will have to accept, and I rather find one myself, that is a bit to my liking, you know? Weather here is kind of okay, we have no frost anymore, till now, but we could do with some more sunshine. There isn;t much more to tell, guess inspiration for writing is gone for a moment, because of the rejection for the volunteerjob. 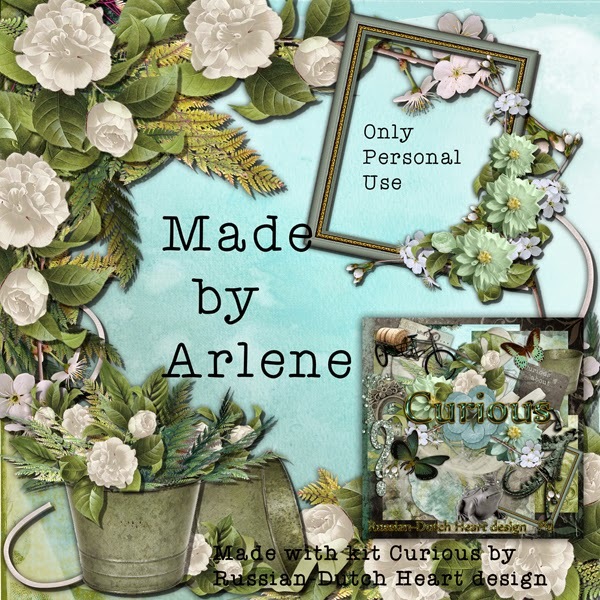 And I almost have to start making dinner, so I better sign off now, with a lovely freebie for you from Arlene, made with the Curious kit. Hopefully Friday I will be more cheerful again, LOL. Catched up a lot of sleep! Oh whee, I slept long this morning! I first woke up around 4.30 at night, I sat down in the living room for a while, had a drink and watched a bit of tv. But after an hour or so my eyelids fell down, so I decided to go to bed again. And only woke up at 10.30 this morning! Gosh, that only happens a few times. Guess I just needed the sleep. Saturday we went to Séverine's birthdayparty, mostly for the grown-ups but we had a nice time. had some chit-chat with a few people and a few laughs and came home later than I wanted. But okay, I still had time enough to make something for dinner. As we usually have a "quick" one I already planned to make something Jan never tasted before. I made Kartoffelknoedel mit Pflaumen, in english Potatoe dumplings with plumes. never made them before, but it didn;t seem to be very difficult. and I had some good memories from eating them tenths of years ago, when I was on holiday with my parents in Yugoslavia( it then was still called that way ) visiting good friends. There we often had lunch with that family and she made us those Knoedel and I just loved them. Now made myself I must say, I had the same sensation, covered with a lot of icing sugar!! I made rather big ones, so with two of them our bellies were completely filled up!. next time I will try to make them a bit smalle, and perhaps fill them with some other fruit. You can use almost everything you want, but plumes are really great for it, as well as apricots or cherries. Yesterday I was rather lazy, only turned on a full washing machine, and made us some stewed pears for desert. That was all and rest of the day I spent mostly at the computer and I uploaded two new kits to Mediafire !. I seem to have found a sparkle of inspiration again and I am happy with it. 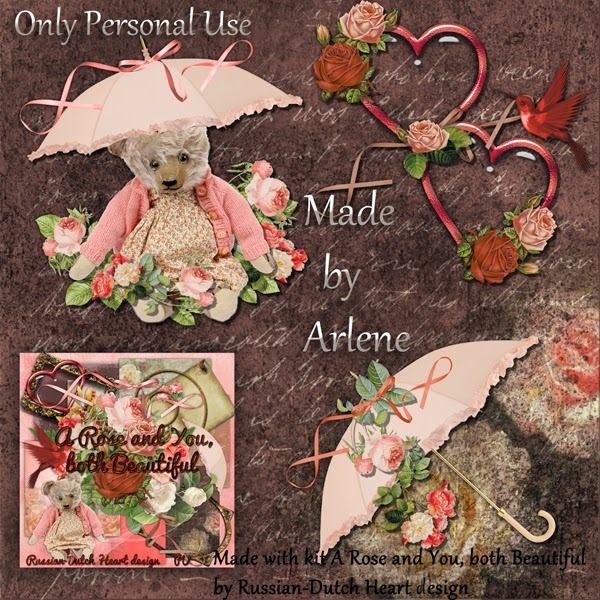 Also made previews of add-ons from Arlene and a surprise from Florence that I will post later in the week. I see that time has flown, so I will end this post now with part two of the kit Curious. if I don;t stop now, I will never get active for the rest of the day I fear LOL! Have a lovely day and till Wednesday! Still cold, but hoping on next week's weather. Gosh, I slept well this night! Once I closed my eyes yesterday night, I knew nothing about the world and slept through all night, how wonderful. Wednesday afternoon i decided to go to the market. Weather looked allright at that moment, even with some sunshine, so well and warm dressed it wasn;t so bad to be outside. But halfway my strolling at the market suddenly the sky became dark and there was a meldted snow shower. Not the most pleasant thing to experience, but thank God it didn;t last too long. Glad I had my furred hood. Think it lasted for about 15 minutes and then the blue sky and some sun came back again. By that time I was all done so I returned home and gosh it was good to be there and be able to put on my sweatpants. Jan received a ltter from Social security office that he should be at an appointment next Tuesday for some volunteer work. he will have an interview with somebody there, and will probably hear what they have in mind. In the mean time Jan already was busy to contact another organasation for some volunteer work. next Wednesday. I will go there too, and hopefully we will find a volunteer job there. It will be great, because the home they need the volunteers is very nearby, about 15 minutes walk at the most! At the moment there are debats in parliament about the decentralization of government functions to municipalities program, specially for the house care budgets for elderly, disabled and lots more. This to provide possibilities people can stay for a longer time in their own home. I've found an article about it in English if you might be interested and if you scroll down on that page more explanationary articles can be found. But in very short: there is chaos at the social security department, that is responsiblee now for the health care budgets, and I don;t think you can blame the civil servants who have to deal with it, it is government that pushed it through too quickly, I think. So far for politics now, don't want to bore you too much with it, but for a lot of people this is a very concerning issue and very important too! 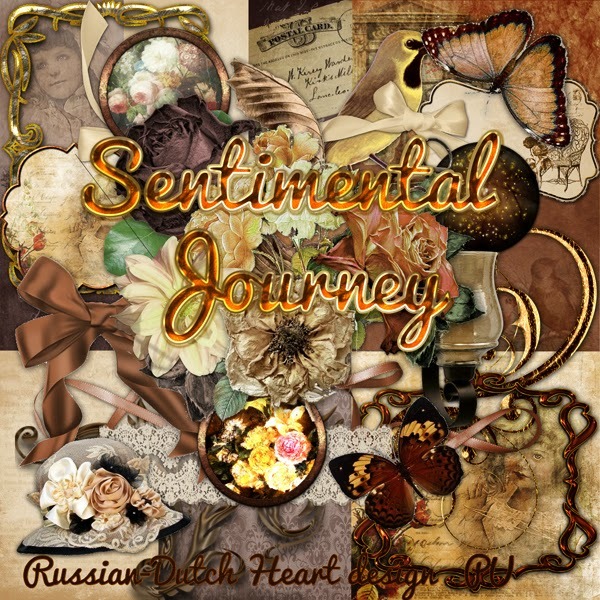 Well, it is getting really late now, soon I will take a sandwich and another coffee and watch one of our favourite programs in the afternoon on the BBC, "Bargain Hunt". 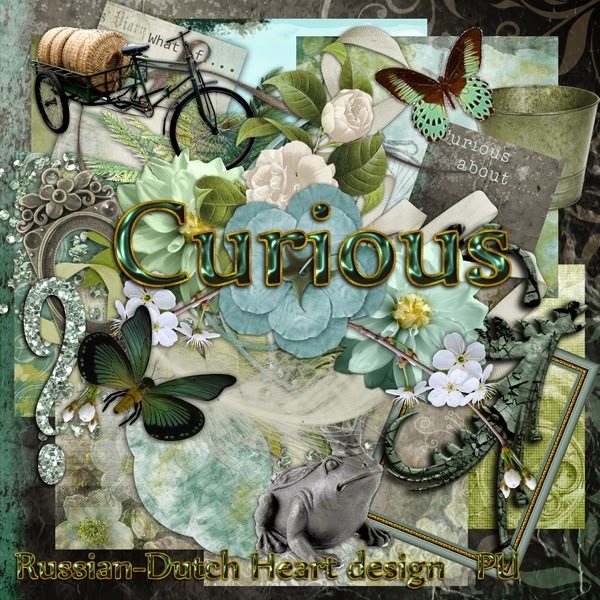 I have a new kit for you today, named "Curious" and it will be in 2 zips, so one today the other Monday. Really like how the color pallet turned out in this kit. Done some needed work last couple of days. Gosh, I feel so bad for all the folks that have to deal with the loads of snow. It is beautiful for a short time, but then it should be gone quick too. Looking out the window now and it isn;t looking too good. Sky is getting dark grey and I see there is a rain, or even melted snow shower going on. Yak, not nice at all. But I already see some lighter sky too, so it will be over soon. Monday I really have done some things I had planned, hoorray! I sent some "official"emails, did a necessary phonecall and then after I got dressed and had a sandwich I took out a bucket with some hot water and cleaning stuff in it and threw myself into the bathroom. I gave that a really thourough cleaning, and when i was almost ready Jan also did his bit LOL. He had a bottle with some cleaning stuff in it to get rid of any mold that was left in between the tiles. Gosh, what a pest that stuff is. As soon as he started spraying it, it had trouble breathing, so I left him there to finish it, and he mopped the floor when all was done. As I had the mop out I also did the kitchen floor and hallway. All is looking clean and shiny again. Then I spent some time at the computer, and now almost am ready to upload one kit and another one is also half done. Yesterday I had to go out to get some bread and cat food and potatoes and i did pick out a good time for it. It was a bit cold but the sun was shining too, so in all it was nice to be out for a while. I should go to the the market one of these days, to get us some vegetables, of which we are running out a bit. But i don;t know if today will be a good day for it, with the weather changing every half hour. Perhaps it will be better later today, and if the sun will shine, I may pop out quickly and hope for the best LOL. 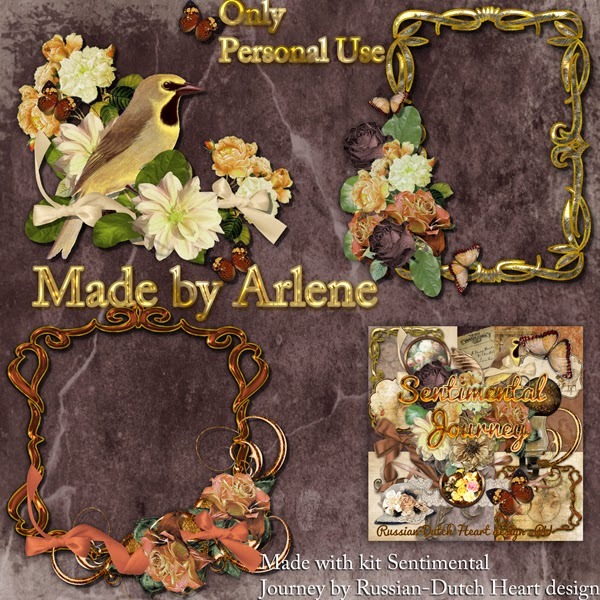 Today I have some beautiful clusters from Arlene, made with the Happy Moments in a Box kit. I am sure you will love to use them. After a rather lazy weekend we will have to do a few things today. Not too big things, but necessary ones. Weather here is rather unpleasant at the moment. Too low temperatures to my liking, some showers that have just rain, but also sometimes melting snow. Not too much wind, but whatever wind there is blowing is a cold one. Brrrrrrr. Now I know we shouldn;t complain because in other parts of the world there is real winter weather bothering people. We stayed in all weekend, on Friday I did the necessary shopping, Jan made a little walk to the market and on the way he passed the bank, so he left there a bill to pay. I spent a lot of time at the computer though, and almost finished a started kit, and also already made a start to a new one. Every now and then I did some blog reading or hopped around on internet, or left the computer for a while to wath a bit tv, it all was very relaxed. Oh my, i just looked at the window and the sky went rather dark and now melting snow is falling down. I see people passing on their bicycles, wrapped in warm jackets, with the hoods on their head, not looking very happy. Coming Sunday will be the anniversairy of Séverine, which she will be celebrating for family and friends on Saturday. Of course Jan and I will pay a little visit, as we recieved a little invitation. It is a;ways a pity of such gatherings, that you don;t have really an opportunity to have a nice talk with Heidi, which is understandable, because she is busy with Danny to provide everyone with a drink and some snacks and they have to give everybody a bit of attention. But it will be nice to be out for a moment. Oh, this weekend there was a bad accident in Rotterdam. Because of an explosion( we don;t know yet of what kind, but it could have been a gasleak or something similair) now about 20 appartments are heavily damaged and ca. 150 people had to leave their home. Probably damage will be so severe that restoration will not be possible. I feel so sorry for them, still a wonder that only two people had to go to hospital and others only had minor injuries and could be helped in the ambulances. But imagine, in a second you don't have a home anymore. and no idea when and where they will have another place to live! It must have been a very big explosion, in a circle of a 100-150 meters lots of windows have been shattered not to speak about the damage of the appartments most close to the explosion. Well, if I want anything to be done today I think I will have to finish this post and soon take some action. Today you will have the second part of the kit Happy Moments in a Box. Wishing you all a wonderful day, and stay safe.